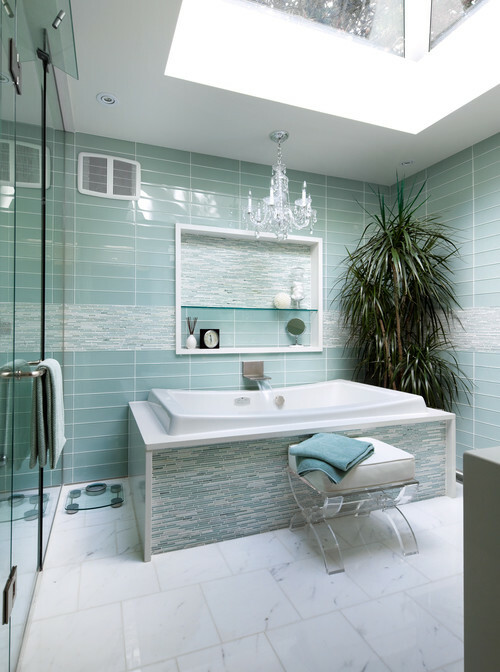 Here is an inspiring collection of bathrooms from interior designers in the Greater Toronto Area! A designer created this small bathroom at a client’s request. The client wanted to have a true European feeling in their bathroom. The design uses porcelain tiles to mimic cobblestone streets and sleek custom designed cabinetry takes advantage of this small space. 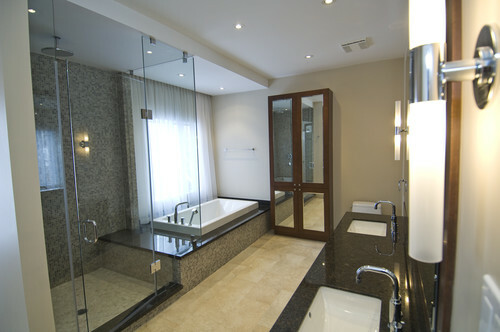 The contemporary bathroom was created in Port Credit, Ontario. 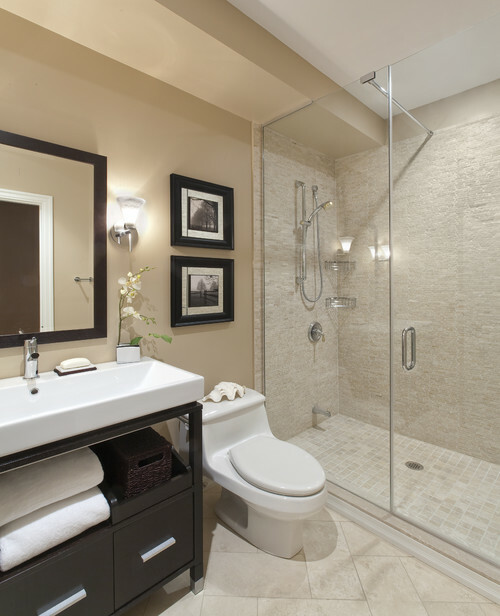 The sleek lines, walk-in shower give a spacious feel to what could have been easily a cramped bathroom. 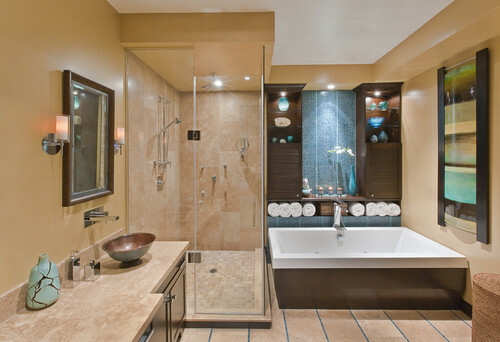 If you have a larger bathroom and want luxury in your space then you might like this Toronto bathroom design. This lavish luxury kitchen has under mount sinks in a granite counter top, a Neptune Zen 3666 modern whirlpool/air tub and a walk in shower with its own granite bench and rain shower. 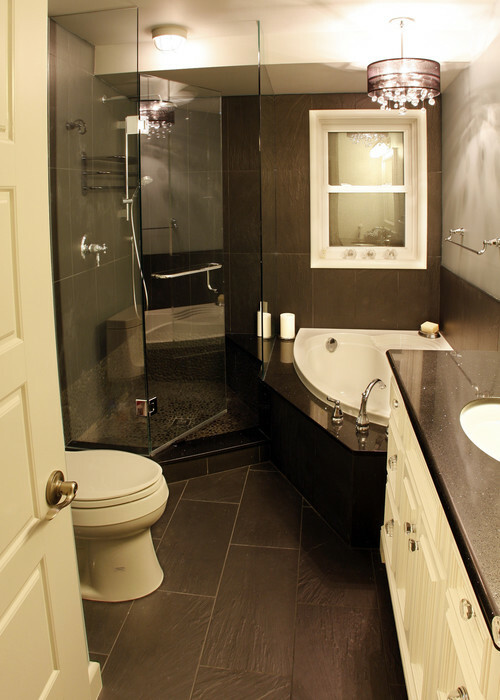 This lovely Port Credit modern bathroom has a wonderful spa like feeling. I love the small tile details and the blue tile backsplash! Whoever said that a small bathroom can’t be sizeable? This Waterloo black and white bathroom was has mirrored glass doors create the illusion of space and the Cayen L/R corner tub maximizes the use of every corner in this bathroom. Not to mention the gorgeous light fixture! 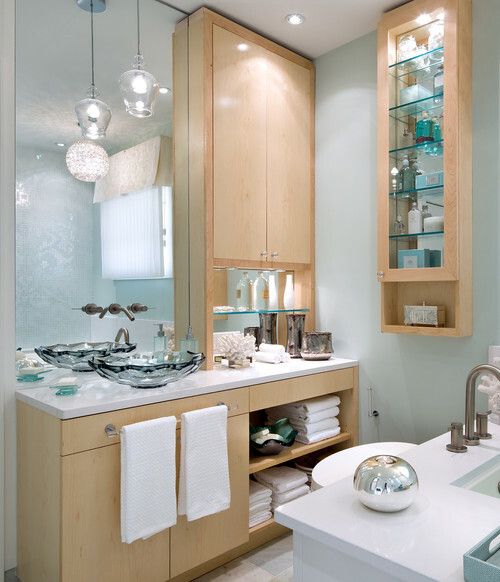 This Toronto master ensuite bathroom was designed with soothing turquoise walls and white flooring. The overall effect creates a wonder spa like feeling. Candice Olson created this cute modern contemporary bathroom. Light wood custom cabinets create a feeling of lightness to this room and the Eureka pendants add an airy feeling to this small bathroom. What is your dream bathroom design? Marika is a writer for the Home Improvement Directory EiEiHome.com and create blogs and articles on home improvement, décor and design.